CREW spends its time filing government complaints and the occasional lawsuit against politicians and interest groups it deems to be corrupt. It claims this is all done in a nonpartisan manner. The group’s history and activities tell a very different story. 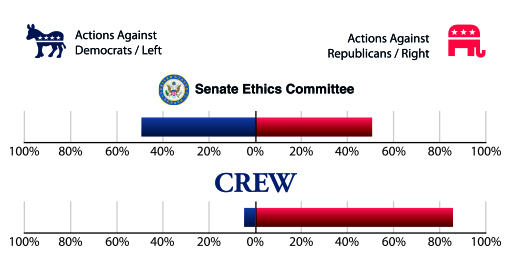 By every measure CREW has attacked a significantly disproportionate number of Republicans and conservative organizations. CREW’s tactics against the right have also been harsher, with the group waging legal battles against Republicans while issuing press releases against Democrats. CREW ignored or underplayed corruption in Congress by Democrats. And when CREW did attack Democrats, it often came after substantial news coverage and law enforcement investigations. 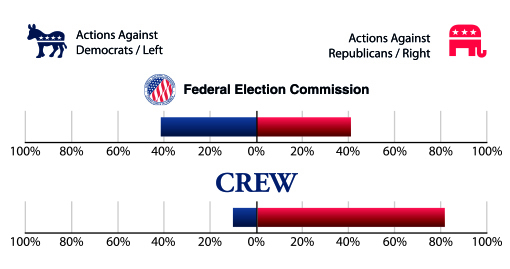 CREW rarely went after Democrats at all until its partisanship was questioned in the media. CREW is funded by a Who’s Who of left-wing donors. Many of CREW’s biggest funders are left-leaning organizations, including the Open Society Institute, the Tides Foundation, and Democracy Alliance. CREW’s founders and staffers have been associated with other left-wing associations. CREW employees have previously worked for Media Matters for America, the American Civil Liberties Union, the Alliance for Justice, and other aggressive left-wing advocacy groups. 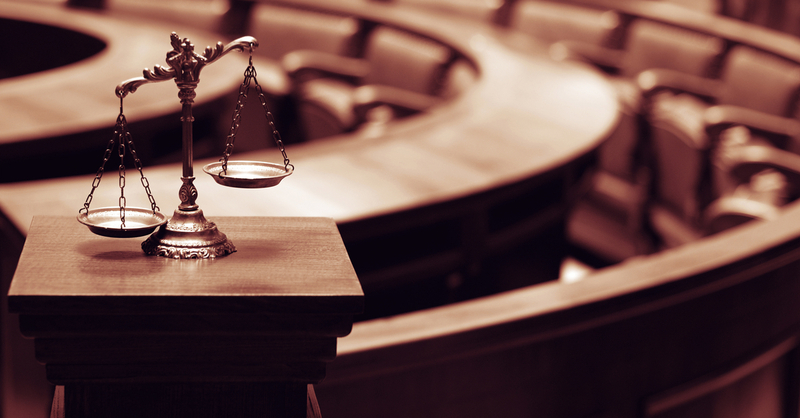 CREW’s partisanship led one attorney to question its tax status. CREW is classified as a tax-exempt 501(c)(3) organization, which prohibits it from supporting or opposing any political party. 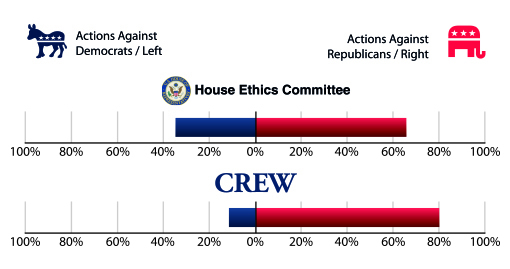 But CREW’s history and actions clearly demonstrate that it disproportionately targets Republicans. Federal Election Commission: Between March 2004 and September 2017, CREW filed 53 complaints with the Federal Election Commission (FEC), of which 81 percent targeted Republicans or conservative-leaning groups. Yet according to a select list of cases compiled by the FEC, only 41 percent of the civil penalties of $50,000 or more levied by the agency since 1980 were against Republican politicians or Republican Party supporters. Source: Federal Election Commission cases in which the civil penalties are $50,000 or greater; 1980 to 2015. Internal Revenue Service: Between October 2003 and September 2017, CREW filed 50 complaints with the Internal Revenue Service (IRS) asking for investigations of congressmen and other political organization. 49 of those complaints targeted Republicans or conservative nonprofit organizations. United States House of Representatives: Between March 2004 to September 2017, CREW filed 54 complaints or requests for action with the House Committee on Standards of Official Conduct, also known as the House Ethics Committee, and the House Office of Congressional Ethics. Of those, 80 percent targeted Republicans while only 11 percent were against Democrats. The rest targeted both Republicans and Democrats. Yet only 35 percent members of Congress disciplined by the Committee since 1967 were Republicans, while 65 percent were Democrats. Law Enforcement: Between June 2003 and September 2017, CREW requested 97 investigations by the Department of Justice and other federal agencies and law enforcement officials. This also includes requests for disciplinary action by state bars and other professional licensors. Of those, 72 percent were directed against Republicans. Only nine percent targeted Democrats. The rest targeted both Republicans and Democrats, or were nonpartisan. Source: Analysis of CREW’s lawsuits. CREW’s former executive director Melanie Sloan claims that her organization filed more complaints against Republicans because theirs was the majority party for many years, making them more prone to corruption. But Democrats also managed to equal Republicans in ethics violations during the 18 most recent years when Republicans controlled the House of Representatives. Between 1995-2007 and 2011-2017, 23 members of Congress were officially sanctioned or were the subject of public disciplinary letters; 11 were Democrats. CREW’s reports also indicate a bias towards left-wing causes. In addition to its legal and procedural actions against specific members of Congress, CREW has also published a number of reports that allege corruption. But a review of these reports found several that were biased in favor of left-wing causes or individuals. “Smoke Screen: How Bush Insiders Distorted-And Still Influence-America’s Debate Over Climate Change.” This report laments the fact that there is more support for action against man-made climate change in other countries, but “[h]ere in the United States, this public consensus is sorely lacking.” CREW speculates that this is caused in part “by what the public was reading and hearing from the individuals who managed climate change policy in the Bush administration.” The report goes on to detail how some former Bush environmental officials went on to work for lobbying or government relations firms and energy companies. “Criminals and Scoundrels: The 25 Most Corrupt Officials of the Bush Administration.” This report lists 25 Bush-era officials that CREW deems to be corrupt. The organization has never produced a similar report about the Obama Administration, a Democratic-controlled Congress, or any other left-wing institution. “Crossing the Line: The Bush Administration’s Efforts to Expand Its Powerful Reach.” This report “details the Bush administration’s repeated constitutional overreaching and abuse of executive power and prerogative.” And yet, even as liberals like Glenn Greenwald and Keith Olbermann criticized the Obama Administration for what they saw as abuses of executive power, CREW has yet to release a similar sweeping indictment against the Obama Administration. “CREW’s Worst Governors.” (2010) This report is similar to CREW’s Most Corrupt list for members of Congress, but instead targets governors. Nine out of 11 governors on the list are Republicans. This is despite the fact that the report was released in early 2010, when there were 26 Democratic governors and 24 Republicans. “CREW’s Most Embarrassing Reelected Members of Congress 2008.” This report lists the ten members of Congress reelected in 2008 whom CREW believed were the most corrupt or dishonest. Seven of them are Republicans and only three are Democrats. This is despite the fact that in 2008, Democrats won 257 seats in the House of Representatives while Republicans only won 178. Democrats also won 58 Senate seats (not including the two independents who caucus with them) while Republicans only won 40.